I thought I didn’t have to make too much effort to learn about Norwegian politics. Yes, I live in Norway, but it’s not like I am allowed to vote or anything. It was quite comfortable as it was: I was used to the brown haired-guy driving a taxi to get votes, and more importantly giving hope and inspiration to all of us after the terrible Breivik-attacks. I even learned his name: Jens Stoltenberg. But recently the elections and the change of government came along, and I got lost. All these new faces came up: three ladies, all blond with short hair, and another guy smiling all the time and and following them around (the Christian guy). Who are these people? What is their program? Why did they win? And then I started hearing that maybe there are too many immigrants in Norway, and that they will start drilling oil in the Lofoten Islands where I spent my summer 2 years ago. WHAAAT? At that point I had no other choice than try to make sense out of this political agitation. So if you are like me, being a bit slow at this, I hope this blog post will help you. Because let’s face it, Norwegian politics are very confusing, especially for those who are not from here. The first rule about Norwegian politics is to get your colours right. I started reading political articles just before the elections, and they were all about red and green and then maybe it will become blue-blue. What on Earth does this mean? So the Norwegians have a colour spectrum going like this: green – red – blue. The more “green” a party is the more at the left of the political spectrum they are (in theory). The more “blue”, the more on the right end of the political spectrum. Some parties are only of one colour, and that makes it easy to guess where they stand in the political spectrum: Høyre (the Conservative Party) is only blue and Arbeiderspartiet (the Labour Party) is only red. Strangely enough three parties have only green as their colour: the Green party (we could have guessed that one) as well as the Centre Party and the Liberal Party. Then to make it more confusing, some other parties have a bit of every colour, don’t even ask why. The Christian Democratic Party (KrF) for example is red and orange (??) and the Socialist-Left party is green and red (SV). Then Norwegians associate two colours to illustrate political alliances. 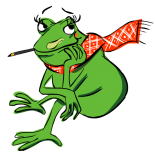 For example Rød-Grønn (Red-Green government) is obviously the alliance between a “green” party and a “red” one. So then non-Norwegians have to take a wild guess, because having no political landmarks in this system makes it difficult to guess which parties we are talking about here as the same colour applies to different parties. My first guess on the Red-Green was an alliance between the Green Party and the Communists. WROOONG. Ok, the Labour party and the Liberal Party then? Wrong again. It was the alliance between the Labour Party and the Socialist-Left Party (red + red/green). Man that was SO easy to guess, why would anyone ever need to explain this to foreigners. “So you see, said my colleague, the risk now for the next elections is that the government becomes Blue-Blue”. How can an alliance have the same colour twice? Well, blue being the colour of the right side of the political spectrum, some parties are light-blue (Høyre – Conservative Party) and others are dark-blue (FrP – the Progress Party). Second basic principle if you want to understand the basics of Norwegian politics: never assume the ideology of a Norwegian political party based on its name. When looking at a list of the Norwegian political parties one could assume for example (like me) that Høyre, meaning “right” is the main Conservative Party, and “Venstre” meaning “left” is the main Socialist or left party. Of course, it cannot be that simple: Norwegians have their own interpretation of “left”. Because believe it or not, Venstre, is not a left party at all. In English they translate their name as Liberal Party, and it is some kind of centre party who was in the “right” block during the recent elections. yet, their colour is green! The main left party is not either the Socialist-left party, it is the Labour Party (remember Jens?). Thank God, Høyre is what you expect it to be, that one was almost too easy. Then comes the Progress party (FrP). When I think “progress” I think “peace, love, understanding, solidarity and green energy”, not “there are too many foreigners in this country” and “let’s not do anything about climate change because it has nothing to do with human activity” and again “let’s pay less tax and have cheaper alcohol”. To make it clearer I suggest they rename it Patriotic Party or the Norwegian Peoples’ Party for the reference to the Danish party of the same type. Something to remind us that it is a far-right wing party. But then again, maybe Norwegian politicians have their own interpretation of progress, as they have their own interpretation of colours. Those were the main Norwegian parties, but there are other smaller ones which have interesting names that do not illustrate their programme at all: the Society Party are anarchists, the Democrats are populists, the Coastal Party is a conservative party and there was even a Beer Unity Party but it died unfortunately. There are many other confusing things that need to be explained, but I don’t want to give you a headache, and to be honest I don’t know much more than what I have just told you. To conclude, still, I would say that you should never expect any party, whichever colour they are, to have a political programme wanting to abolish the Welfare system. This is not the U.S.A, and however conservative a party might be, NAV and pappapermisjon are sacred in Norway. Do you understand more about Norwegian politics after reading this blog post? I hope so, but if you don’t, relax, you have plenty of time to learn. If you just arrived in Norway, you will be allowed to vote in communal elections after being here for 3 years. But now that the Progress Party is in power they want to take it up to 10 years (see, they just gave you 7 more years to figure out all these colour-codes!). Plus, by the time you are allowed to vote, if ever, you might have your visa renewal rejected because of some new rule they passed! 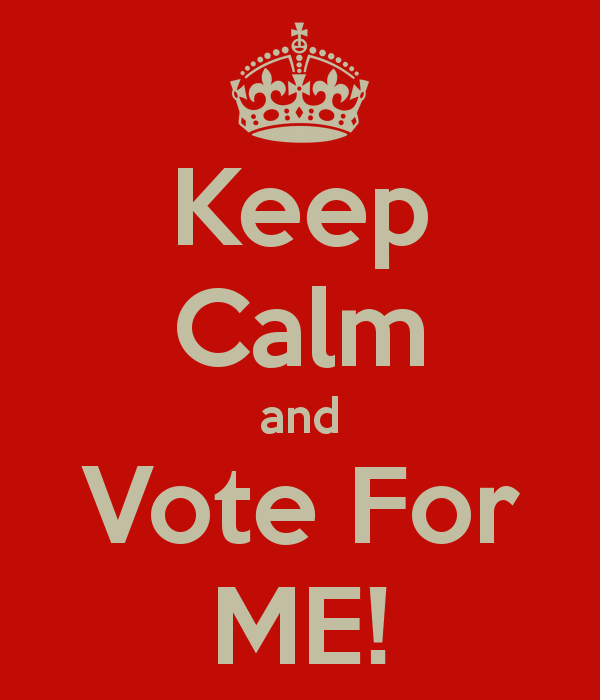 So, keep calm, and vote for me! A bit of there. I will explain. The spectrum goes Red (left), Green (Scenter), Blue (Right). The blocks are Borgerlig (less government) vs Sosialdemokratisk (more government). In later years, green has also been associated with environment, which is why SV is red-green. KrF has decided that they are yellow, since there economic politics are neutral. Yellow? I didn’t know that. Thanks for the extra info! hehe, no, i dont think so. In Norway it is seen as a simplification. Although a debate about moving away from a linear spectrum towards something else are starting to take pleace. Anyhow. We had to political parties. Then the world changed, and communists entered the arena in large parts of Europa. In Norway the Labour party. Yes, they used to be almost a communist party at the start, hence the colour red. And also the reason why they are a lot more to the left than the left party, who were never a communist nor a labour party. We also did have a communist party back in those days, but the labour party became a huge movement, and the reason why Norway change into the country where we have the welfare system we have today. Thank you labour party for all that. As such, red and blue are colours of a political scale, but until now, with the Green Party on the rise I think Green has not had much to do with the political agenda, just with the colour of the logo. We have had two political parties who proclaim to work for what we consider green ideas. One on the left side (SV) and one on the right (V), but I do not think they would be considered thus outside of Norway, nor of the people voting for the Green Party in Norway. The same is true, I think for Krf, yellow is their logo, but has yellow in any country been a political colour? I don’t think so? The easiest way to divide Norwegian politics has been Right, Left and Centre. Right has been H and Frp. Center has been Sp, Krf and V. Left has been Ap, Sv and Rødt. (Although in my opinion, Ap and H are so much alike in their politics they have more in common than anyone else, and could very well form one party on their own.) The Green Party made a mess out of this order entering the arena this last election, saying that they were neither left nor right, and would not support either side, as it meant supporting either Ap or H. They said the difference for them as the Green Party was to divide into parties supporting green political views or grey (more oil please! We are saving the world with our wonderful oil) parties. Haha! I love your blog! So much fun seeing Norway from the outside! Interesting topic and interesting blog! The colour scheme has really taken hold in Norway with the last government, which actively used “red-green” as their marketing slogan for their government. before that it was not quite as normal to refer to a government in terms of colours, but rather by the placement in the ploitical spectrum, i.e. there was a “centre government” with the three “middle parties”, a “borgelig” government with Høyre (sometimes with KRF and V in support), or a “sosialistisk” government with Labour. The political colour scheme however, is fairly normal in (Northern-) Europe, where the colours blue and red are most commonly used (in papers, on tv etc) to separate the conservative and socialist/social democratic blocs in elections and parliament overviews. For instance, most social democratic and socialist parties in Northern Europe (and I would imagine also in France?) use red as their main colour, including SPD in Germany, Labour in the UK, Social Demcorats in Sweden and Denmark etc. Blue is used by the Conservatives in the UK, the Moderates in Sweden etc. The red, of course, stems back from communist times, when a red flag was used as the symbol for the growing socialist parties in Europe. In Germany, the “right”, i.e. conservative, side uses black as their colour instead of blue, to signify that the CDU/CSU are not only conservative parties, but also have a religious element to them, which is mostly lacking from other Conservative parties in northern Europe. In some ways the Norwegian Liberal Party (Venstre) should therefore perhaps use yellow as their colour, and part of the Party did (the LIberal People’s Party, the part that was pro-EU membership for Norway) until the mid 90’s or so. The colour green has been introduced relatively recently, with the growth of green parties in central Europe (Germany, France). In Norway, the Green Party itself did not catch on until the most recent election (they have tried for 20 years to establish themselves) so both SV and V opted to use the colour green in their logos to signify “environmental policies” and try to gain control of the voters that feel that environmental policies should be critical, but also look at more than just the environment when they choose a party. Interestingly enough, in the US the colours are used in the opposite way of what one would “expect”, from a European point of view; the democrats are blue and the Republicans are red, with independents often listed as green or yellow on the electoral maps. I suppose this shows that the colour red does not have the same communist/socialist history in the US as it does in Europe. The term “Reds” and “pinko”, pink being a light variation of red, still are pejorative for communist in the USA. The reason that red refers to the. Republicans, the right wing party and blue to the Democrats, is because a national TV news network, used those colors on a map of US states to show which had voted Republican and which Democratic. It was an arbitrary color coding of the map and it sort of stuck after that. It’s really just two sides: Red (left) and Blue (right). The green colour is about the enviorment, and therefore the red-green is left with focus on the enviorment. We have only one party in parliament that has not taken sides (left or right) and that is the green party, which has their main focus on the enviorment etc. (Do not get confused about the colours on their logo, it doesn’t nessicerily match the side the party has taken). You are absolutely right about Venstre and FrP though. You can never trust the names. The green center parties can shift sides between the coalitions or create a goverment by them self. That has usaly been the norm in Norwegian politics. They will rather see the situation today, than have a ideological belief. FrP was/is primarily a party against taxes and government control. This seems to confuse many foreigners, especially during this last election. The party was initially called “Anders Lange’s Party for a Strong Reduction in Taxes, Duties and Public Intervention”. It’s true that it’s one of the most immigration critical parties, but this is not it’s main issue. I liked reading your blog and how you experiance Norway, but when I came to read this post I actually got very dissapointed. You got FrP and the politics we stand for all wrong. I worked in the party for many years, and we are libertarians. Sorry, I did’nt finished the last sentece. one can also bring a tad of brown to som parts of the frp basic voters. the ppl that on public forums said thing like to bad abb didn’t kill more immigrants etc etc. even some frp representatives, said things like that. Previous Previous post: Recette: Boulettes d’Elan à la Juive Marocaine. Next Next post: How to Make Norwegian Friends?